UNITED NATIONS, August 9 -- Alternate candidates to Ban Ki-moon are emerging before the next UN Secretary General term begins on January 1, 2012. 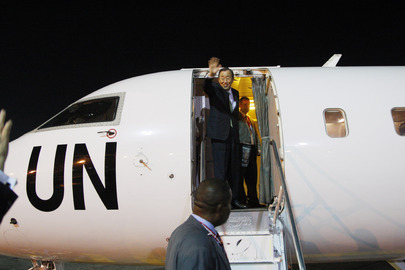 Tellingly, even people given UN posts by Ban Ki-moon are among reported candidates. Ban named Staffan de Mistura as his representative in Afghanistan, after de Mistura hired Ban's son in law Siddarth Chatterjee as his chief of staff with the UN in Iraq. (Ban's son in law has since been hired by Jan Mattsson as a high official of the UN Office of Project Services in Copenhagen). There is “blood in the water,” these sources say, particularly following the damning End of Assignment report of Inga Britt Ahlenius. Ban's “melt down” then retraction on August 9 about job promises made in the course of replacing Ahlenius won't help either. When the U.S. vetoed Egypt's Boutros Boutros Ghali in 2005, the post next went to another African. So it would be with Ban, the assumption goes, with China demanding equal treatment for Asia. De Mistura, having served as U.S. ground cover and fig leaf in Iraq and then Afghanistan, feels he would have U.S. support. A long shot candidate mentioned is Bill Clinton. Others point to Jose Ramos Horta of Timor Leste, in the Asian group like another candidate, Zeid Bin Ra'ad of Jordan. Lula of Brazil would appear to have lost U.S. support, given his country's vote against the recent sanctions on Iran. Shashi Tharoor appears to have shot himself in the foot with Cricket-gate. More savvy, some say, is Michelle Bachelet. She is understood to have not leapt at the offer of the top UN Women post. Does this mean that, like with the UNICEF post given to Tony Lake, she is shooting higher? From those heights, at UNDP, Helen Clark is often mentioned. There are other plotters. Some point to the alliance between Ms. Ahlenius and Alicia Barcena, who left the top UN Management post when Ban came in and went to ECLAC in Santiago, Chile. She was in New York and dined with Ahlenius shortly before Ahlenius leaked her memo. Also involved, sources say, was Barcena's Management predecessor Christopher Burnham. In the Security Council, placating or giving patronage to the five Permanent Members would be enough to gain the second term. But if the GA and regional grouping get involved, Ban's snubs like that of Africa for the deputy post in the UN Development Program, and the devaluation of the Office of the Special Adviser on Africa, could come back to haunt Ban, along with his more recent appointment of Alvaro Uribe to his Gaza flotilla panel, over the objections of Venezuela which wil head the Group of 77 and China. Watch this site.